Once you make it to Alzheimer's World the stress and anxiety associated with caregivng are greatly reduced. Amazingly, many of the behaviors that were driving you crazy become normal. When I arrived on the scene to take care of Dotty in 2003 you would think all I had to do was use the communications skills I had developed over the course of my life and everything would be "Hunky-Dory". As is turned out it was more like "heartbreak hotel" in the beginning. I had a good grasp from day one that when my mother was being mean spirited or downright crazy that it was the Alzheimer's disease that was causing the problem. But, no matter what I did, I made things worse. I knew her brain was sick. So I never had a problem understanding why she was being so difficult and challenging. In spite of knowing and understanding this as clear as clear can be, her behavior was still driving me crazy. Our daily interactions included an enormous amount of stress and dread even though I was trying as hard as I could to avoid it. I was trying to unlearn the things that didn't work and use the things that did work. This didn't work. I had been communicating with my mother in a certain way for my entire life, and no matter how hard I tried I would eventually fall back into that pattern. I couldn't unlearn what I had been doing my entire life. I finally realized I needed to learn a brand new way of communicating with my mother. A new way to communicate with someone living with dementia. One night while working with my da Vinci pad I came to an important conclusion -- something had to change, and that something was me. I would never be able to "unlearn" my entire life. I just couldn't do it. I concluded I needed to invent a brand new world, a place that was very different from the world I had lived my life in. I needed to invent a new place, go in there, and start learning from scratch how to deal with a person living with Alzheimer's disease. Don't get me wrong, I was taking my skill set with me, but I needed to learn how to think, act, and communicate in a new way. In my new world, I was going to learn how to accept everything that was happening as the "new normal". 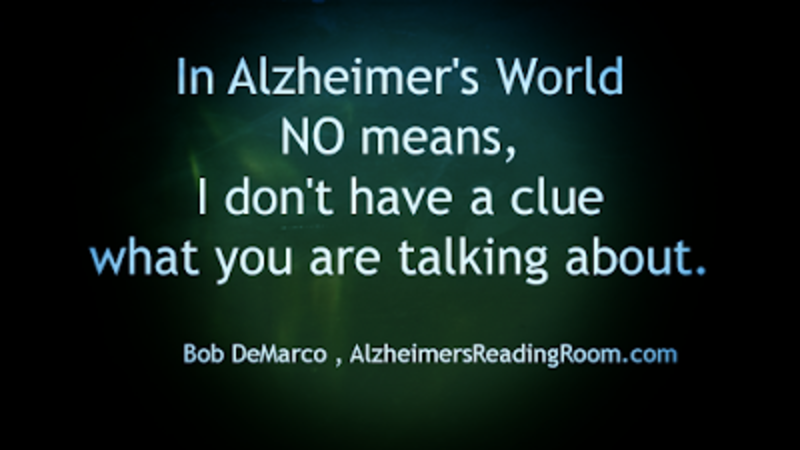 I gave my new world a name -- Alzheimer's World. Dotty and I would live together in this new world. Next, I did something I could never have expected. When I knew that I needed to shift gears, to get into the World, I started taking one giant step to the left. In order to get to Alzheimer's World, I had to physically step into Alzheimer's World. After a small amount of practice steps it started to work. I would step into Alzheimer's World, shift the mental gears in my brain seamlessly, and I learned how to communicate with someone living with Alzheimer's disease. I learned how to communicate with my mother on her terms. Here are the best parts. First, instead of getting bent out of shape when problems arose, I actually started feeling very comfortable, very calm. Second, the same exact behaviors that were hurting my heart, that were driving me crazy, and that were stressing me out were now expected. I had arrived. I finally accepted the new normal. Some of the things that Dotty did still bothered me. But mostly they made me laugh (happily I mean). I would think to myself, "here we go again". Imagine that, laughing instead of crying or getting all bent out of shape. Dotty became a nicer, kinder, gentler person. Now don't let me mislead you. This practice, concentration, and a bit of hard work. Don't worry, you can do it quicker than I did. You now have the benefit of my experiences here on the ARR. Once I had Dotty calmed down and secure, and me calmed down and confident, I learned I could accomplish much more. I mean, Dotty stopped being mean and nutty, and I stopped feeling guilty and all stressed out. Alzheimer's World is a good place. A wonderful place in fact. This is what I learned. Once I could actually deal with Dotty effectively - communicate with her - I decided we could start attacking the big problems. The big problems? Pee, Poop, Shower, and a real big problem -- the word NO. As far as I can tell the majority of Alzheimer's patients say NO (about 70 percent). In the real world, NO means NO. 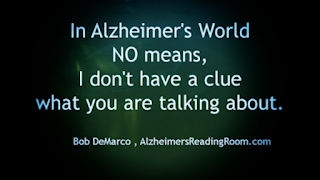 In Alzheimer's World NO means, I don't have a clue what you are talking about. You have to be actively involved with a person suffering from Alzheimer's in everything they do.